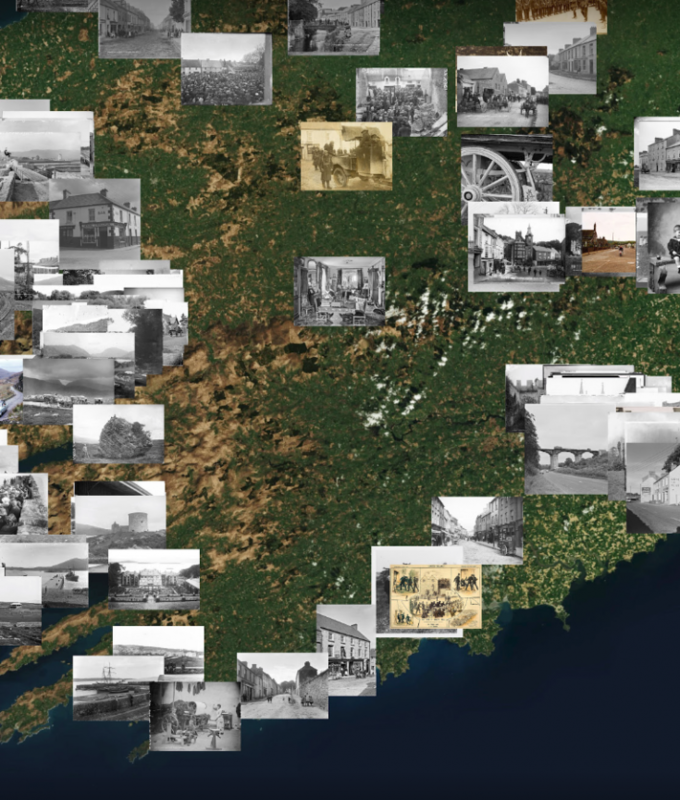 I was approached by a friend at National Library of Ireland who wanted to show a print map, poster sized, in the Photo Detectives exhibition which showcases the spectacular results they have had crowdsourcing mystery photographs from their archives on Flickr Commons. Whilst the requirement was solely for a print output, the thought of manually placing nearly 2,000 images on a map was a daunting task. So I took an open source library based on Leaflet maps and a free base layer of mapping tiles and made a digital version from which I rendered a single image file from, amazing just using the Open Screenshot Chrome browser extension which has the seemingly unique ability to scroll horizontally as well as vertically. It still struggled a bit on a machine with 16GB RAM and I had to split it into four quarters and then join them in Photoshop, with the final image measuring about 8,000px x 11,000px. As the live map loads 2,000 images it’s too cumbersome to share the interactive version publicly, but there’s a zoomable version of the high res image available here.